Kloxo is a light-weight control panel that is both memory friendly(Need Apache reconfigure) and powerful. It has all the features included in all leading control panels, and you can easily configure all aspects of your website such as mail, spam filter, PHP, CGI, Perl, apache, FTP, MySQL and much more. This guide is meant to get you started with Kloxo and explain the basic features needed to get your VPS website up and running. Web Hosting System Services: Server service status menu, Server process status menu, Server component status menu, Mail, HTTP & MySQL logs and Cron job/Task scheduler. However, Kloxo is supporting CentOS or Red Hat EL (versions 5.1+) only. If your VPS provider is not giving you these Linux flavors you cannt install Kloxo. 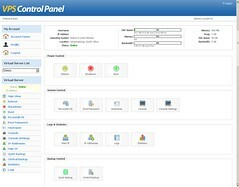 After you purchase your VPS account with a Webhost, they will provide you with VPS Server IP and control panel login. VPS provider also Provide another IP, thats for your website (Eg:200.192.100.99), Same IP can be seen in your VPS control Panel. Goto your Name Server section, there you will find Child name server option into new VPS name servers, as you are creating your own Name servers based on your Website hosted on VPS. Same IP can be used to creat multiple nameservers, if your Domain registrar(DR) is not supporting multiple IPs ask your DR to configure for you. Mean While You can buy Another IP from VPS provider, If you want to keep stable Nameservers. Once you done with adding Nameservers on DR, you can creat name servers pointing to your website in your VPS panel in KLOXO panel later. Now Login back to VPS server. Once Linux is installed,You will find a “Shell Account” or “CONSOLE” Link on main panel. click on it and login with your password. Once login is successful you will in shell acount of System. Kloxo installation consists of downloading either kloxo-install-master.sh or kloxo-install-slave.sh from download.lxlabs.com and executing them as root. They will download all the required files and install them for you. once Everyhting is finished, just reboot from VPS panel[it will take Few minutes], see Everything is comes up normally. username will be admin/admin. change password as soon as you log in. KLOXO Control Panel will look Like this. Click on (+) of your website, Under DNS add your nameservers [ eg : ns1.mywebiste.com and ns1.mywebiste.com ] same you can set in DNS template on Right side Panel too. If you are using Google APPS mails for your Domain you can add Google Apps entry under Mail entry of your website name under Domain. From shell panel, you can run “top” unix command to see the memory usage of your VPS server; or from VPS panel itself. hope this will reduce almost 100K of your memory usage. ANYONE NEED ANY HELP CONFIGURING, LET ME KNOW.